Michael and Michelle traveled to Orlando, Florida to be married in in a destination wedding in front of their family and friends. 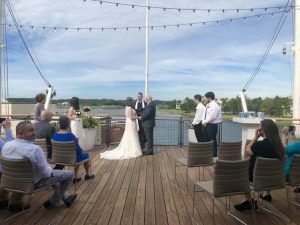 After speaking with Victoria from Intimate Weddings of Orlando and seeing all the options they wanted, the couple chose Paddlefish at Disney Springs as the ideal location for their intimate wedding ceremony. Located in the heart of the Walt Disney World Resort, Paddlefish offers great views of the shopping and entertainment district, as well as beautiful views over the lake to Sarasota Springs Resort. Michelle and Michael loved the idea of being able to have their ceremony and reception in one location without breaking their financial bank. Flowers by Lesley crafted the beautiful red and white bouquet and boutonniere for the couple. Christopher Smith from Snap Photography captured every moment, from the moment the couple arrived, the ceremony, and then into family portraits afterward.